It's the tourist season for couples to come to London for their weddings. The most popular background for their photos is Tower Bridge. 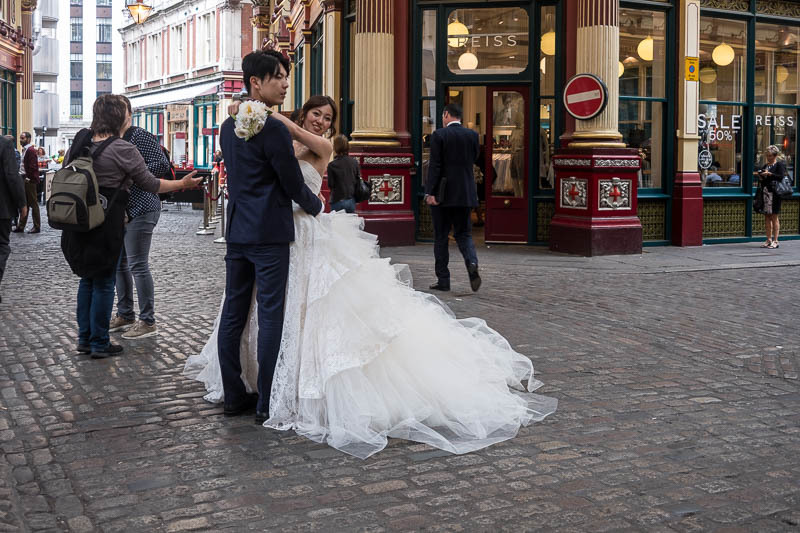 However this couple have chosen the 14th century Leadenhall Market in the City of London, now more famous for representing "the leaky cauldron" and "Daigon Alley" in the film Harry Potter and the Philosophers stone. It is a picturesque location..
That is a pretty busy place to have pictures taken. That is quite a big and fluffy dress too! Sounds like a fun wedding trip. The Canal locks, Major's Hill, and the Arboretum tend to be popular spots for wedding photographers here. That's a great photo, Mo. You've captured the wedding excitement of the couple and the wonderful ambience of the area.